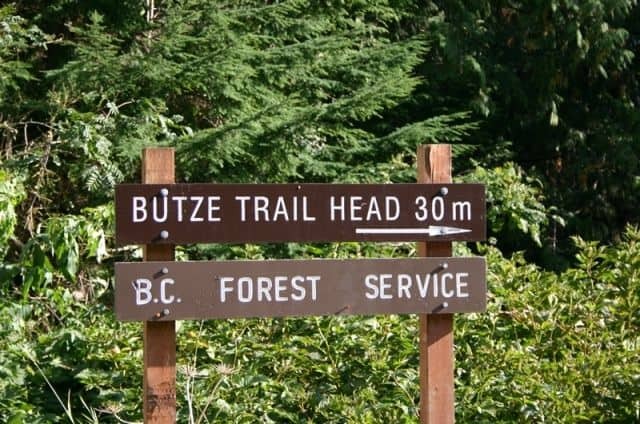 Butze Rapids Park and Trail in Prince Rupert, British Columbia, Canada is one of the more popular trails and natural scenic sites in the area. The reversing tidal rapids is created by the tidal currents around Kaien Island causing Fern Passage to reverse on each tide. The tidal rapids are most impressive about half an hour after high tide. 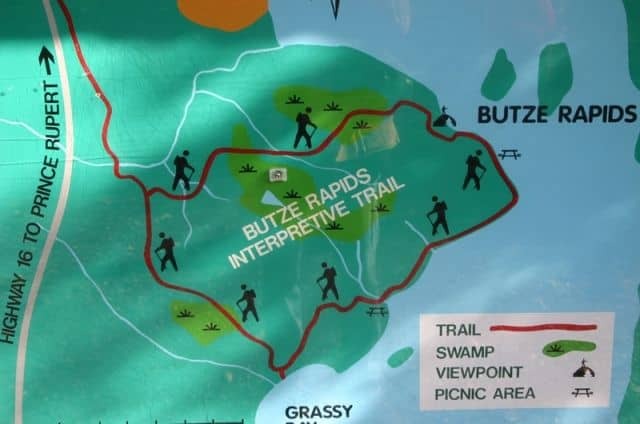 Butze Rapids is a popular attraction accessed by a 5 kilometre easy going well-maintained, mostly chip-covered trail leading to a viewing platform (1.8 km from the parking lot) which overlooks the rapids. 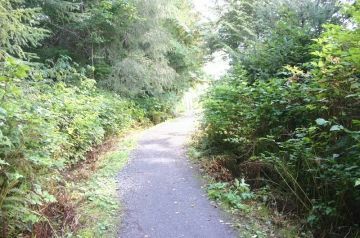 There are boardwalk sections on the trail which can be slippery. The hiking loop trail should take no longer than 2 hours to complete. The trail is an interpretive hike through old growth forest, trekking across bogs, wetlands & swamps carpeted with moss and stunted pines. This Butze Rapids Trail was built in 1992 and received improvements in 2003. The Grassy Bay Trail ties into the Butze Rapids trail making for a full day of fun while exploring forested eco systems and reversing tides. How to Get Here: Travel towards Prince Rupert, B.C. on Highway 16 (Yellowhead Hwy). Before reaching Prince Rupert, at about 6 km east (4 miles) , on your right hand side is Butze Falls Parking Lot.